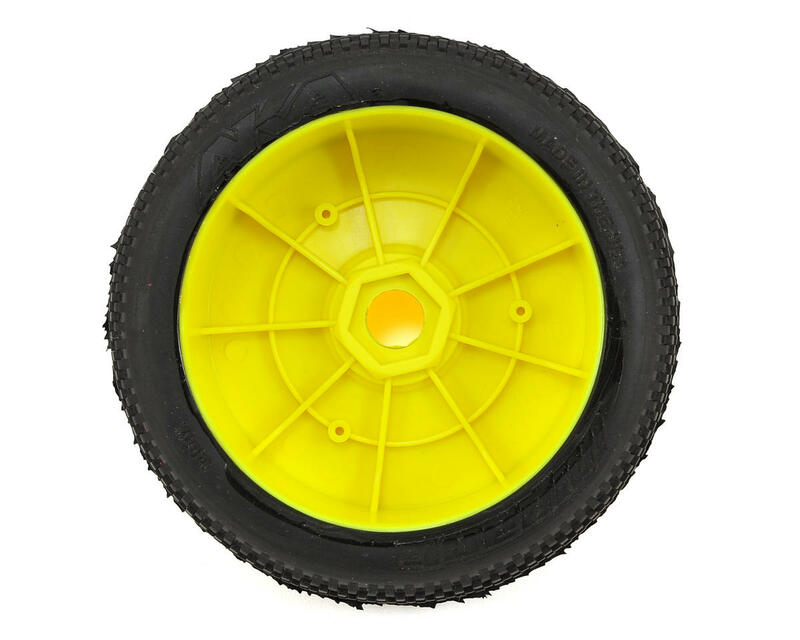 This is a set of two AKA Impact 1/8th scale off-road buggy tires, pre-mounted on yellow EVO wheels. AKA's R-Line pre-mounts feature AKA's World Championship winning EVO wheel, and when combined with the stiffener disc (34003Y or 34003W), is the most technically advanced wheel available. The R-Line pre-mount also features AKA's soft red insert (34001S) which was also used by Cody King to win the 2010-2011 1/8 Buggy IFMAR World Championships. 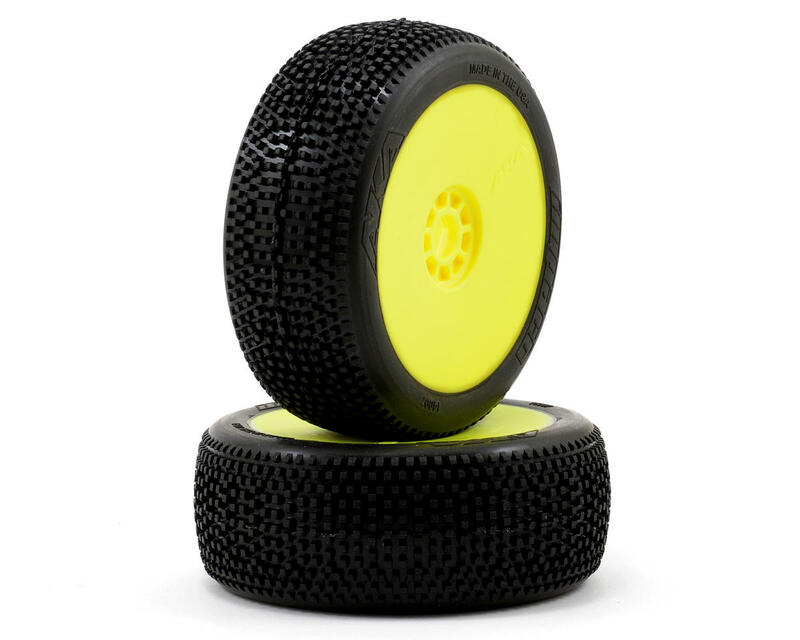 Combine these two revolutionary products with the quality and endurance of AKA tires and the result is the most technically advanced pre-mounted tires ever offered for 1/8 Buggies. The IMPACT tire features a dense small square lug pattern with offset lug rows in the center of the tire to deliver maximum forward traction and good wear characteristics. The two outer rows of lugs are parallel to create a circumferential groove at the edge of the tire to give the tire very predicable side bite. This allows the car to rotate in the center of the turn while still feeling very stable and predictable. 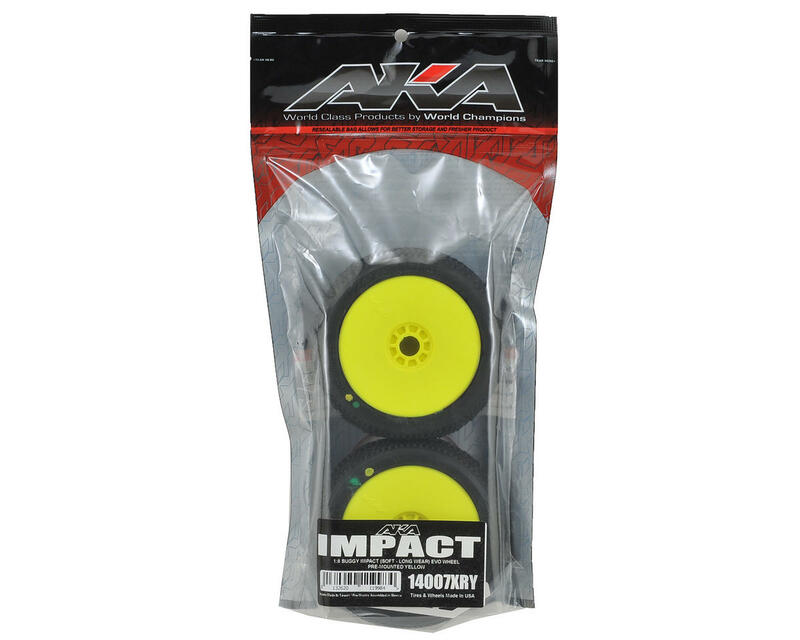 The IMPACT is built on AKA's latest carcass design featured on the ENDURO and WISHBONE tires and is available in all of AKA's proprietary compounds. Red Insert (Soft): The red insert is designed to soak up the big bumps with its fluted I.D. while still holding its shape in the turns to increase corner speed and consistency. Balance: Like AKA inserts and wheels, tire balance is critical to superior performance and it's a priority in AKA tires. Mold components are manufactured to the highest tolerances to ensure the best possible alignment of all the mold components. This results in a tire with more uniform thickness for the best possible balance. Assembly Quality: AKA R-Line Pre-Mounts are all hand assembled using AKA Premium tire glue and are double checked for adhesion quality. There is no doubt AKA has the best pre-mounts in the industry. Soft long wear impacts are awesome. I already loved the impact tread in standard soft, and I was worried that the feel would be different on track when going to the new long wear compound. I was very happy to find that they feel exactly the same. We run a watered track at silver dollar raceway in chico California and these tires have given me three full events already and I plan to do another, this is with ebuggy power and I drive aggressively. the tires are still on pace and still holding up great. The long wear soft compound is definitely impressive.